Open House. Open House on Sunday, January 29, 2017 2:00PM - 2:45PM BY APPOINTMENT 2:00-2:45 Please contact us to register 604-868-1651 or jeff@jeffbenna.com THANKS! Please visit our Open House at 1070-80 15TH AVE W in Vancouver. Open House on Sunday, January 29, 2017 2:00PM - 2:45PM BY APPOINTMENT 2:00-2:45 Please contact us to register 604-868-1651 or jeff@jeffbenna.com THANKS! CHARACTER SIDE BY SIDE DUPLEX on a quiet, tree lined street. This renovated home with Mission Style architectural features has four units. There are two, three bedroom, two bath units on two levels and each side has a one bedroom, one bath, garden apartment below. The upper units are fully renovated. There are beautiful hardwood floors, spacious, bright rooms, and updated kitchens and baths. Newer roof, updated windows and mechanicals for modern comfort. This is an ideal property for a shared purchase, providing accommodation for extended family or selling the big home to downsize with extra income. Great location with easy access to everything the Westside has to offer. YOU'LL LOVE IT! I have listed a new property at 1070-80 15TH AVE W in Vancouver. I have listed a new property at 6975 MARGUERITE ST in Vancouver. Style and sophistication are the cornerstones of this South Granville custom home. Completely renovated in 2014 with top of the line finishes throughout you'll be proud to call it your own. Large, private 66x144 ft lot. Beautifully landscaped. Inside is almost 7000 sq ft of luxury living. Bright open concept, with limestone floors, sunken living and intimate den. A dream kitchen with over sized island and the best appliances is a chef's delight. For en suite bedrooms up, including a master suite, spa-like retreat. An indoor pool that opens with a window wall to the south and sunny, west facing backyard. Steam room, billiards room with professional size table, media room with theater curtain. Inside and out built-in sound system, upgrade HVAC and roof. One of a kind. YOU'LL LOVE IT! 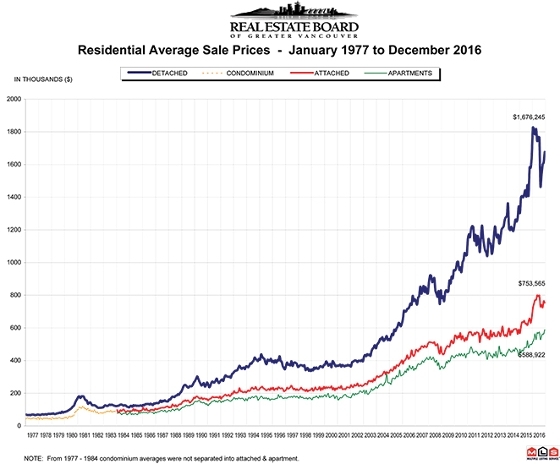 VANCOUVER, BC – January 4, 2017 – The Metro Vancouver* housing market had its third highest selling year on record in 2016, behind only 2015 and 2005. Sales of detached, attached and apartment properties in the region reached 39,943 in 2016, a 5.6 percent decrease from the 42,326 sales recorded in 2015, and a 20.6 percent increase over the 33,116 residential sales in 2014. Residential properties listed for sale on the Multiple Listing Service® (MLS®) in Metro Vancouver reached 57,596 in 2016. This is an increase of 0.6 percent compared to the 57,249 properties listed in 2015 and a 2.6 percent increase compared to the 56,066 properties listed in 2014. The MLS® Home Price Index (HPI) composite benchmark price for all residential properties in Metro Vancouver ends the year at $897,600. This represents a 2.2 percent decrease over the past six months and a 17.8 percent increase compared to December 2015. Residential property sales in the region totalled 1,714 in December 2016, a decrease of 39.4 percent from the 2,827 sales recorded in December 2015 and a decrease of 22.6 percent compared to November 2016 when 2,214 homes sold. Last month’s sales were 8.1 percent below the 10-year sales average for the month. New listings for detached, attached and apartment properties in Metro Vancouver totalled 1,312 in December 2016. This represents a decrease of 35.1 percent compared to the 2,021 units listed in December 2015 and a 58.3 percent decrease compared to November 2016 when 3,147 properties were listed. The total number of properties currently listed for sale on the MLS® in Metro Vancouver is 6,345, a 5.3 percent increase compared to December 2015 (6,024) and a 24.3 percent decrease compared to November 2016 (8,385). Sales of detached properties in December 2016 reached 541, a decrease of 52.4 percent from the 1,136 detached sales recorded in December 2015. The benchmark price for detached properties is $1,483,500. This represents an 18.6 percent increase compared to December 2015 and a 1.8 percent decrease compared to November 2016. Sales of apartment properties reached 915 in December 2016, a decrease of 25.3 percent compared to the 1,225 sales in December 2015.The benchmark price of an apartment property is $510,300. This represents a 17.3 percent increase compared to December 2015 and a 0.3 percent decrease compared to November 2016. Attached property sales in December 2016 totalled 258, a decrease of 44.6 percent compared to the 466 sales in December 2015. The benchmark price of an attached unit is $661,800. This represents a 20.4 percent increase compared to December 2015 and a 0.8 percent decrease compared to November 2016. I have sold a property at 2207 1308 HORNBY ST in Vancouver. SALT by Concert Properties, 2 bedrooms + den corner unit on the 22th floor facing South East with WATER AND CITY VIEW, this is only a 2 year old building. Functional floorplan, open concept kitchen with top European integrated appliances (Blomberg/fisher paykel) and quartz counters. Building feature fitness center, party room, rooftop garden and concierge. Walking distance to English Bay, Yaletown, transit, food and shopping. Only 3 blocks from the sea wall, comes with 1 parking stall and balance of 2-5-10 years warranty.